As a kid I occasionally swapped toys with my friends. I remember making some shrewd marble deals with cat eyes, swirls and clearies. Later in junior high and high school I swapped clothes with girlfriends, though usually it was more like long-term borrowing. There was a jean jacket with red stitching that I got from someone. I loved and wore that jacket for months until the original owner finally wanted it back. Alas, alas. But I haven’t done a swap in eons…until now! Somehow later in life my brother Dan ended up with it, but it was in his guest bedroom, rarely looked at. Hmmm…perhaps my brother would be willing to do a swap for something that’s in my store. Indeed he would! 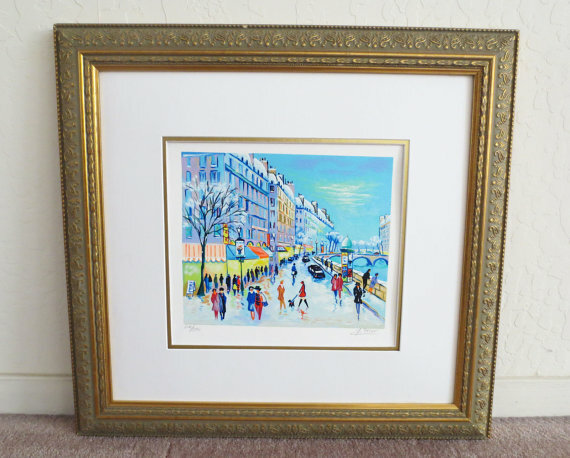 He has always liked the Jean-Claude Picot “Winter in Paris” print. Gulp…it’s one of my pricier items! (He does have good taste.) But it has been in my store for over 18 months and I know he’ll appreciate it. And of course, in return, I’ll be getting a little piece of my childhood…which is priceless! So the swap is ON. 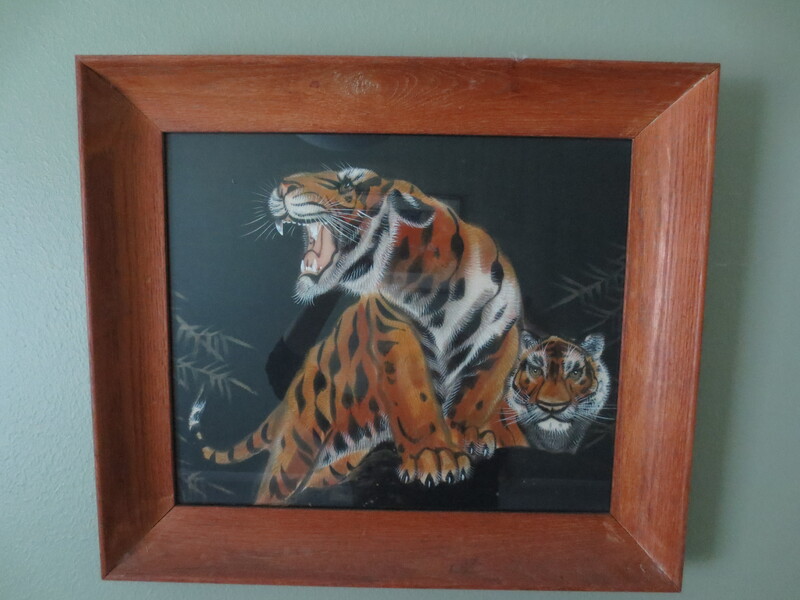 And now the tiger painting that was created in Japan in the ’50s and has since resided in New York, Florida and Texas is now at my house in California! I’m pretty jazzed about it. I rather like the idea of swapping or bartering for things. But it can be tricky: Things need to be perceived as having similar value or there’s no deal! Case in point: A few months back an Etsy seller made an offer on a unique hand-made cross-stitch sampler I have listed for $125. Actually what she said was “If you ever decide to lower the price, please let me know. I might be able to come up w $50.” Which is a curious way of making an offer and didn’t really leave any room for negotiation. And $50 wasn’t even in the ball park. It wasn’t even in the parking lot of the ball park! I declined her offer. She then suggested I could pick something from her store and we could swap. I checked out her store and while she had some nice things, nothing was close in value to the sampler. I had to decline. How about you? Ever swap items with someone? Barter services?